You are here: Home » The Tyler Shale: Waste Overburden or Phosphate Ore? The Tyler Shale: Waste Overburden or Phosphate Ore? Proponents of the proposed iron mine in the Penokees claim that there are two kinds of rock: overburden waste rock (the Tyler shale) and iron ore. To date, the main concern with the Tyler is the presence of sulfide in the form of pyrite, or iron sulfide. When disturbed by mining and exposed to air and water, pyrite oxidizes to produce sulfuric acid, which is toxic and would cause serious environmental damage to the Bad River watershed and the Kakagen Slough. Two weeks ago we presented results of a compositional analysis of a sample of the Tyler shale. Our sample contains a substantial amount of pyrite, confirming the results of previous studies and other workers. After re-examining our data, we now know that the distinction between waste rock and ore is false. Both rocks are potential ores. The Tyler contains not only sulfide, but also economically minable phosphate in the form of apatite, or calcium phosphate. The phosphate content of our sample ranges from 5 to 10%. There is no reason to suppose that our sample is unusual. Phosphate is not homogenously distributed, and in places may be as high as 20% or more. Phosphate has been reported from the Tyler and from contemporaneous black shales in Michigan and Minnesota. 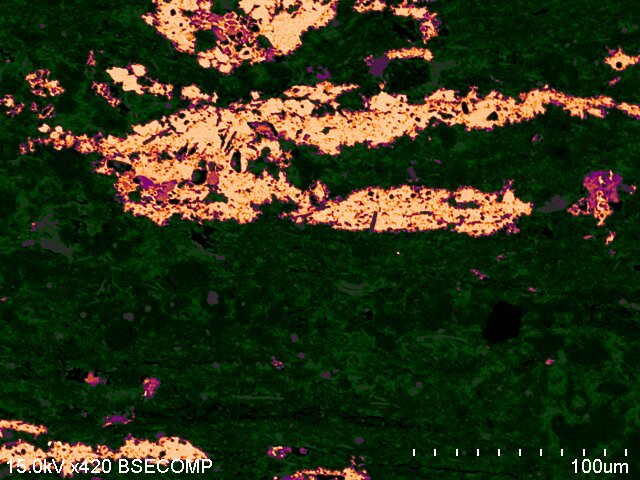 False color image of the Tyler shale showing its mineral composition. Yellow = ferrous sulfide, lavender = calcium phosphate, greens = silicates (quartz and biotite). Iron mining in the Penokees likely will result in large areas of land being covered with crushed, phosphate-rich rock. If significant amounts of this phosphate enter the bad river, the results could be massive algal blooms that cutoff sunlight and deplete oxygen in water. The ecological consequences of phosphate pollution are severe and well documented. Anyone familiar with the great bowls of pea soup Madison lakes become in the summer knows exactly what phosphate can do to bodies of water. Additionally, phosphate runoff is responsible for large “dead zones” in the Gulf of Mexico, and has polluted parts of the Mississippi River. At this point, we can only speculate about whether Gogebic Taconite (GTac) is aware of phosphate ore in waste rock overburden, but there are important consequences to this new information about phosphate in the Tyler shale. While the United States is awash with cheap iron ore, it is facing a critical shortage of phosphate, which makes phosphate mining potentially far more profitable than iron mining. In the search for new sources of phosphate attention will turn to the Tyler shale. From the 1950s through the 1970s the US Steel Corporation took over 200 core samples of the iron deposits in the Penokees. Many of these cores include parts of the Tyler Formation. These cores currently are in the possession of RGGS Land and Minerals of Texas, the company that now owns mineral rights in the Penokees and is leasing them to GTac. Many questions about the Tyler could be answered by examining these cores. To date, RGGS has refused give the public access to them. Whether GTAC has seen the cores, and how much information GTAC has on the composition of the Tyler, is not clear. What is clear is that detailed information about the composition of the Tyler should have been available to legislators and the public long ago. That fact the presence of phosphate in the Tyler is only now coming to light, on the eve of the final legislative debates over mining, is a mark of how little science has actually been considered in the drafting and discussion of a “scientific” mining bill. And the fact that media coverage of the mining bill has included almost nothing about the scientific issues involved shows how ill prepared the Wisconsin press is to competently report on the mining issue. To repeat: the distinction between waste rock overburden and iron ore is false. Both rock are types of ore. If AB 426 passes GTac or another company could open an iron mine but make its real money on phosphate. In any case, any mine in the Penokees will expose to the Bad River watershed to the effects of both sulfate and phosphate pollution. 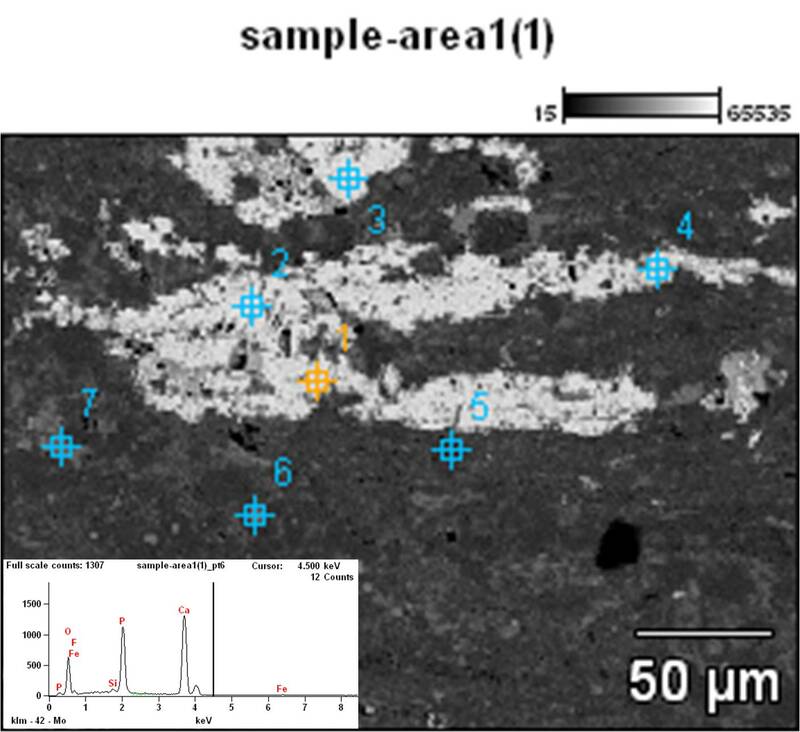 Elemental analysis of an apatite grain in the Tyler shale, showing the presence of calcium, phosphorus and oxygen. It is interesting, and I’d like to know more and I agree that the scientific basis for the GTac proposal is missing – but neither would I call the Tyler a phosphate “orebody”until size, shape, grade and mineability at a profit have been demonstrated. I don’t disagree. Without knowing more about the distribution of phosphate in the Tyler it is impossible to know how valuable it might be as a source of phosphate. What we do know suggests that it could be quite valuable. If we could see the US Steel cores we would be in a much better positions to speak intelligently on the subject. However, as you indicate, the presence of phosphate in the Tyler does raise environmental concerns whether or not the phosphate is economically valuable on its own. You missed one major point here, you are looking at phosphate bearing minerals where as fertilizer is chemicals such as Potassium hydroxide. Potassium hydroxide is used as a fertilizer because it is 56,000 times a soluble as Calcium Phosphate. Oh my, a little actual science work instead of hype and the crisis is averted. Hmm. Before you lecture me on science you might want to learn the difference between phosphorus and potassium. It’s right there on the periodic table, I swear. Whoops, KOH is one of the usual fertilizers, Ammonium Phosphate, another fertilizer, has similar solubility, so the point is the same. Either way Calcium Phosphate has a solubility in the range of .02 g/liter. That and have you looked at the Bad river lately? Its not a nice clear watershed your trying to save. It is a murky, nasty, mess with the general consistency of chocolate milk. The Bad River is not polluted with phosphate. The Bad River supports the Kakagen Slough and large stands of wild rice, among many other things that sulfate or phosphate pollution would destroy. If that doesn’t concern you, if what you are claiming is that adding phosphate to it doesn’t matter because you think it is “is a murky, nasty, mess” then frankly you’ve lost the argument. You probably overestimate the solubility of calcium phosphate in water, because we’re probably dealing with a less soluble form, fluorapatite. But what matters is not whether it is soluble, but whether it is bioavailable– and it is. If apatite-rich dust from the mine finds its way into the watershed (which is inevitable) the phosphate can be accessed and released by bacteria, fungi and plants, which is the whole problem. If anything, the low solubility of apatite probably makes the problem worse, because it means that the phosphate will not simply be flushed out of the river in a year or two, but will persist in the sediments. Apatite frequently is radioactive, for the same reason that it frequently is high in REEs: it has a high affinity for uranium, thorium and REE cations in solution. This affinity is so hight that apatite, in the form of fish bone, is actually used to trap uranium in contaminated groundwater. Tailings from phosphate mines in Florida contain 100s to 1000s ppm uranium. I have found dinosaur bones (which are composed of apatite) that were 2% uranium. In many settings apatite IS harmless, just as sulfides are harmless in many settings. Phosphorus-limited aquatic ecosystems is not one of those settings. Yes, that is ok, but please link to this page. If the Apatite in this formation is radioactive then that should be the subject of the article. As of right now you are just clogging the Internet with bad science. If you want to actually fight a mine, find a real, provable, and scientifically correct reason to do so. Throwing darts at a wall will do you no good unless there is a target there somewhere. Personally I am tired of misguided environmentalists trying to save the world from threats with bad science. It makes the people that actually have good science behind them have to work ten times as hard and as a result you are causing more harm than good. This is right up there with showing pictures of the environmental damage of sulfide mining by using the example of pre-1920 open furnace smelting. That was a disaster and it caused a lot of problems, which is exactly why it is illegal. If you want to save the world do so by putting honest and truthful information about what you are trying to say out there. Filling the stream with ground up drivel chokes us all. I have no idea if the apatite in the Penokees is radioactive or not. You revealed your ignorance of the topic when you claimed that it is not radioactive, and I merely corrected you. Apatite is famous for trapping uranium and thorium. The fact that you don’t know this does not suggest that you are terribly well informed about the question at hand. But even if the Tyler apatite is radioactive this still wouldn’t be the most important potential environmental issue. Uranium-rich apatite is not terribly dangerous unless you inhale it or are in a confined space with it where radon can build up. Sulfide and phosphate pose far more serious dangers. Where is the bad science? Be specific. What have I said that “people with good science behind them” will disagree with? Do you disagree that there is phosphate and pyrite in the rock? I have provided the evidence that there is. Do you disagree about the effects sulfate and phosphate can have on rivers and lakes? If so, why? These effects are well documented. From what you have shown here you have a very weak grasp of the science involved, and are not in a position to make a distinction between “good” and “bad” science on anything other than political grounds. And that doesn’t count. If you look at the article the only Apatite formations that have been found to be radioactive are in the Florida region. Wisconsin is not Florida. Apatite is famous for trapping loose Thorium and Uranium, but the Thorium and Uranium has to be present for it to be trapped. Or did you think that they just naturally occurred? The bad science. Sulphide mining has changed, it is not open put smelting directly releasing the gaseous sulfur into the atmosphere anymore. Even processing up at the Sudbury complex now has scrubbers to remove the sulfur from any emissions. Calcium Phosphate has to be treated with nitric acid before it is made into something that is water soluble enough to be used as a fertilizer. As it is it is an inert mineral. You are throwing all of this information out there about how the Bad River basin and Lake Superior are going to have algal blooms and the next thing without understanding the chemical processes which are required for the chemical to cause those blooms to be produced. Unless if they start using nitric acid to dissolve the tailings the phosphate is going to remain chemically bonded to the Calcium. Oh, another major source of Calcium Phosphate…. Milk. Oh dear God! We had better start killing all the dairy cows! You are completely out of your depth here, and are making a fool of yourself. You clearly are trying to get a crash course in chemistry from Wikipedia and other online sources as you type. What “article” are you referring to when you say that uranium occurs in apatite only in Florida? That simply is wrong, and not something anyone who knew about the topic would ever say, regardless of their opinion on the iron mine. The association between apatite and uranium is common and occurs around the world. Where does the uranium come from? From groundwater. All groundwater has some uranium in it, as do all rocks. Uranium is not rare. It occurs everywhere, and is commonly concentrated in apatite. But, as I have already said, uranium in the Tyler probably isn’t a problem in the first place. The sulfides in the overburden are not a problem because they will be smelted or chemically treated. You are confusing nickel and copper mining with iron mining. The sulfides (pyrite) will just be abandoned in spoils heaps where they will oxidize to produce sulfuric acid– again, a very well documented phenomenon. Bill Williams (the president of GTAC) himself acknowledges this problem with sulfides, which is the whole justification for creating a separate law for iron mining in the first place. Natural apatite is treated in various ways to make it a better fertilizer. This does not mean that the phosphate in it is unavailable without treatment. Soil organisms can dissolve almost any mineral. Amazing how right the anonymous are. Shall we do this by parts…. Apatite occurs everywhere, Radioactive apatite does not. Apatite has the ability to filter out radioactive materials, but those materials have to be available to be filtered. Uranium, is actually extremely rare, Not only is it difficult to produce in the universe, it breaks down because it does not have any stable isotopes. In order for Sulfides to break down they have to be in contact with water, which they already are since, last time I checked, we do not live in a desert. The Sulfides in this deposit were most likely deposited there by ground water during the development of the Duluth complex. The fissures that were there then are still there now, it is just not as hot. The Phosphate is available with out treatment, but the amount of the phosphate that is available is far lower then the amount that would be required to cause an algal bloom. Anyway, I have more important things to do than this; involving sushi and grad students. So the sulfides will not break down because in order to break down they need to be in contact with water, but because they have been in contact with water they won’t break down. That’s some mighty fine reasoning there, Jeff. By that “reasoning” no sulfides in rocks ever can break down, because all rocks are wet. Even– in fact especially– in deserts. Someone should tell the sulfides. Uranium is quite common. Average garden soil is about 1 ppm uranium, making it richer in uranium than much platinum ore is in platinum. And yes, it does break down. That’s why it is radioactive. I congratulate you on making that connection. But 238U has a 4.5 billion year half life. It’s cosmic abundance has more to do with its susceptibility to formation by neutron capture in stellar cores than with its instability. “… the amount of the phosphate that is available is far lower then the amount that would be required to cause an algal bloom.” Really. And how much phosphate would that be? Wow. What an exchange. I remember when my son, William, was little. He could go after his dad and try hard to take him down. All my husband had to do was stick an arm out to keep the little one at bay. For some reason, this came to mind as I read the conversation between Hematite and Harrison. Harrison, if you actually knew who you were conversing with, you would silence yourself and listen. Do keep a copy of this for your future. It will help you see, in the future, how beneficial humility is, both in learning something and in living a good life. Now, be quiet and consider that, although your opinions are strong, they are not correct. And if you will read, study and learn, then you, too, may grow up to be an expert in the field. But it does take humility and the willingness to learn from others. Tomorrow morning, it’s off to the library for you!! Hematite: Your efforts and your patience are both appreciated. I like your site too. Lawyers call that “stroking”. So next I seek facts. To the best of your knowledge – what thickness of Tyler is significantly pyritic? Do you know David Meinecke who gave the 2006 field trip and presentation? Will he speak with scientists – who might be able to arrange for responsible mining of his taconite? If he recognizes the GTac effort as a scam? What happens if we have two pails of the same pondwater with a little sediment – and add some finely ground apatite to one of the pails, leaving both exposed to sunlight. Will sulfuric acid affect the solubility of apatite? Enough for the time being. Thank you, and good night. Thanks. From what I have seen the Tyler will be exposed, to a depth of perhaps 1000 feet, on the north wall of the mine. The total amount of Tyler removed in the first phase of the mine will be in the range of 0.5-1.0 km^3. Pyrite content of the Tyler is known to increase with depth, so it is highest closest to the Ironwood. I don’t know about the phosphate, and I’m not sure anyone does. Again, if we could see the cores it would help a lot. I do not know Meinecke, but we used to publication from the field trip for a trip through the region we took a few weeks ago. It’s a little late in the game to arrange for scientists to speak to the legislators, which is why I’ve been trying to get this stuff at least out and available even though I don’t have nearly as much data as I would like. Right now it looks like the WI legislature will vote next week. As far as I can tell it has received no scientific testimony on the proposed mine other than from the mining company, which has not admitted that there are sulfides in the Tyler. Apatite is soluble in sulfuric acid. On the other hand, phosphate can slow pyrite oxidation by scavenging Fe3+, which catalyzes pyrite oxidation even in the absence of O2 (which is only needed to initiate oxidation– after that it is self-sustaining). So how the whole thing would play out in real life is very difficult to predict– especially when you add the effects of fungi, soil microbes, and organic acids. It has crossed my mind many times that this whole proposal is some kind of scam. The iron ore in the Penokees really is very poor, and all it would take is a slight drop in demand (say, from an economic slowdown in China) for it to cost more to mine than it is worth. But I don’t feel qualified to speculate about that. The owner of GTAC has no previous experience in iron mining, and perhaps it is just not thinking very carefully. Bucket experiments like those you suggest would be interesting, and are the kind of thing that should have been done long before the proposal got to this stage. Basic failure to understand physics, chemistry, and geology. I give up on trying to educate the uneducated. Don’t be so hard on yourself, Jeff. I’m sure you can understand if you try hard enough. Agendas are more powerful than facts, at least when you watch Fox news, to which this is a disturbing parallel. Curious as to Jeff Harrison’s academic background and current employer. Can he tell us? totally share your frustrations on the lack of science in mainstream reporting. Questions: If phosphate is so precious on what logical or economic basis can we assume as you forewarn; “mining …. likely will result in large areas of land being covered with crushed, phosphate-rich rock”? Missing, by me at least, is rationale that concludes a profit-seeking company would willfully waste a more valuable ore. I would also submit, with most humble deferrence to your obviously superior geologic expertise, that the idea of a mining operation being able to profitably separate and thereby eliminate, a potential pollutant, might just as easily be considered good news instead of a scare tactic. Frank: Thank you for the comment. It is hard to answer your question because GTAC has not been very forthcoming about what its plans actually are. There are two end-members of a range of possibilities. At one end, it is possible that everything GTAC has said is true, that it has not looked at the cores, that it has no idea what is in they Tyler shale, and that this is an iron mine pure and simple. In that case the mine will uncover pyrite and apatite in the process of recovering the iron, which is a problem that has not been discussed at all by either by GTAC or the legislators. The whole rationale for creating separate laws to cover the mining of iron oxides is that iron oxide mining will not uncover sulfides. The presence of sulfides in the Tyler undermines this rationale. At the other extreme is the possibility that GTAC knows exactly what is in the Tyler and is hiding it, either to prevent the issue of sulfides being raised during debate over a bill that creates an artificial distinction between “sulfide” and “ferrous” mining, or to hide the presence of phosphates for one of several possible reasons. So, if everything is what it seems, then an iron mine in the Penokees will expose the Bad River watershed to both sulfate (from the oxidation of sulfide) and phosphate pollution. If things are not what they seem, and GTAC will be going after phosphate in the Tyler, then the whole “ferrous” iron mining bill is a distraction. You are correct, of course, in that phosphate removed from the rock is phosphate that cannot get into the Bad River. The pyrite would remain, however. Also, no mining is completely efficient. Not ALL of the phosphate would be captured. Phosphate mining in Florida has caused phosphate pollution, including in the Gulf of Mexico. But the real issue that I am trying to raise is that the simple distinction between iron oxide (“ferrous”) mining and sulfide mining that is the cornerstone of the proposed legislation does not reflect geological reality in the Penokees. Proponents have repeatedly referred to of AB 426 as a”scientific” mining bill and have frequently argued as if the Penokee mine will uncover nothing more dangerous than iron oxide. Apart from a handful of scientists who spoke for a few minutes as private citizens at public hearings, legislators have neither received nor solicited any independent scientific testimony on the bill. I am not opposed to mining in principle, but the issues I am raising here should have been part of the discussion from the beginning. The fact that of AB 426 is on the verge of a final vote and that such basic aspects of the geology and chemistry of the Penokees as the presence of sulfide and phosphate have not been discussed at all should bother anyone who cares about science in public policy. If I adopted a somewhat alarmest tone it was only because the JFC is scheduled to vote on of AB 426 on Monday, and I really think that it is important that this information get out there before that. The basic point is that there is phosphate in the Tyler, and that this will be uncovered by the mine. Thank you for the response. This all looks like it is boiling down to a matter of sequence. To wit, aren’t the issues raised here supposed to be covered in the permitting process? It seems to me, unless I am being naive to consider government entities up to the task, having all pertinent science questions asked and answered, if it isn’t already, certainly ought to be the primary function of the regulatory agencies involved. If the EPA, DNR, Corps of Engineers et. al. are signing off on permits without scientific due diligence what the hell are we paying them for? Under the current law what you say is correct: all of this would come up during permitting, and there would be ample opportunity for the issues to be discussed. The problem is that AB 426 changes the permitting process, and exempts iron mining from important environmental standards. The justification for these changes is that “ferrous” (sic) mining is fundamentally safer than sulfide mining. If the Penokee mine will uncover significant sulfides, and there seems to be little doubt that it will, then this justification no longer makes sense. Moreover, under AB 426 opportunities for the DNR to challenge data presented by the mining company are severely restricted, and the opportunity for the public to challenge the company is eliminated completely. So the time to do due diligence on the state level is before the bill passes. You are correct about the EPA and Corps of Engineers still having a say. I’d add that the tribes also have considerable power, especially to set water quality standards in the bad river. The drafters of AB 426 (we still don’t know who that are) seem to have ignored these federal and tribal powers, setting the stage for extended law suits should an iron mine be permitted under a new state ferrous mining law. For this reason even some mining proponents dislike AB 426, because rather than speeding up the permitting process it seems destined to slow it down by forcing into the courts. Many observers have been left scratching their heads, and wondering whether opening an iron mine is the real goal of GTAC and its legislative supporters. If it is the real goal, then this whole process has not been very well thought out. Re current versus proposed environmental standards, have you or anyone explained the specific changes in a good old before/after format? The link log keeps coming back to sulfide versus ferrous. Are we to understand then that if we take their word for it to get started that there are no or minimal sulfides that would be the final word on the matter forever? If so then forget it, but it seems to me a reasonable solution might be a requirement of regular unannounced compliance inspections modeled on those endured by every food vendor in the state. If the low or no sulfides claim is made in good faith it should necessarily be accompanied by a willingness to cooperate in ongoing verification. Otherwise the claim is suspect as is the good faith, which, from this observation point seems to have been an early casualty. If the mine procedes as planned, large areas of land WILL be covered with crushed phosphate and sulfide bearing rock. If there are plans to extract the phosphate, they have not been made public. At least in its public statements, GTAC is only interested in the iron. If this is not true, now would be a good time for GTAC to mention it. “1% Walker” in no way embodies the Wisconsin Idea, although he certainly believes what he’s doing qualifies as a national model. How about we mine your backyard, Frank? My conscience simply won’t allow me to surrender the existing environmental protections without a full and open public debate. If the mining company needs these changes to build their mine outside of Mellen, the least they can do is explain those changes publicly to the people who’ll be affected. People may say I oppose mining because I won’t acquiesce on the alterations to environmental law, But the reason I won’t just concede on the environmental issues is that many of people making the decisions aren’t capable of doing so without the participation of others. I’ve said from the beginning, any new mining reforms could well be visited on my district in Southwest Wisconsin. There are only a few places in this state where viable iron deposits exist, and the Baraboo Range happens to be one of them. That’s a golden rule I’ve tried to keep in mind throughout this process. Could I defend this legislation if it came to Sauk County? Time and again it became apparent during the Assembly hearings some of our best and brightest minds on mining in the state had not been included in the process. To move mining reform forward, we need a full and open process on environmental law, with respected contributors at the table. If you want the wisdom of the state, you have to be smart enough to listen. Well Aunt Bee, now that you mention it, I live in the city of Milwaukee, where in some areas a toxic open pit mine would actually be an improvement. So now it is a year later and it seems this bill will now really be signed into law. Has anything else been offered by the backers of this bill as to it’s safty. How about those cores. Has the information in those cores been made public. —“cores currently are in the possession of RGGS Land and Minerals of Texas, the company that now owns mineral rights in the Penokees and is leasing them to GTac. Many questions about the Tyler could be answered by examining these cores”. It seems reasonable to think that RGGS has a profit reason for keeping the information in the cores a secret.